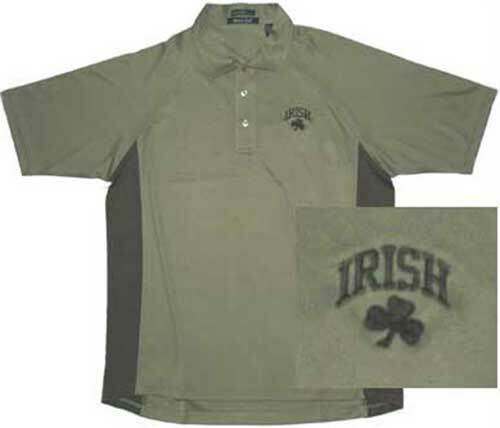 Irish polo shirt features an embroidered shamrock along with the word IRISH. This Irish polo shirt features polyester/spandex gussets and built-in UPF 30+ sun protection and had a breathlite 2 layer system. The base layer keeps your skin dry by wicking moisture away while the outer layer keeps your skin cool in hot weather. The solar shield Irish golf shirt features a 2 tone olive green color with an embroidered left chest design that includes IRISH and a shamrock. This Irish polo shirt has an easy care fabric that is designed to wick moisture away from your skin! This Irish sport shirt is only available in sizes small and it is received with a shamrock history card, complements of The Irish Gift House.